Welcome to Logpointe Housekeeping Cottages, a Muskoka lakeside cottage tradition for over 90 years. These traditional, Muskoka style housekeeping cottages with modern amenities are nestled on the shores of Muskoka's beautiful Gloucester Pool, part of the Trent Severn Waterway. Our waterfront cottages are fully equipped, providing you with complete housekeeping requirements to enjoy on your Ontario vacation. The Muskoka region is one of the most sought after vacation destinations in the world, and we try to honor that prestige by offering our guests first class lakeside vacations. Our housekeeping cottages are located right on the water, giving you breathtaking views of sunsets and sun rises over the lake. The cozy waterfront cottages are perfect for a romantic couples weekend retreat. The lake at Gloucester pool is ideal for a weekend fishing getaway. The lake has a variety of species of fish, providing a unique fishing experience for anglers of all skill levels. At Logpointe Housekeeping Cottages we rent out motor boats to our guests who are up on Ontario fishing trips or for those that want to explore the area's beautiful waterways. 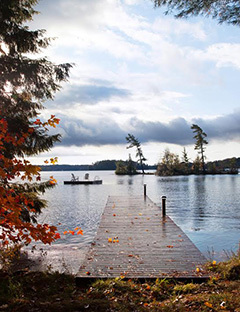 Less than 90 minutes north of Toronto, you will enjoy nature at your doorstep with majestic pines and sugar maples, crystal clear waters offering fabulous swimming, boating and fishing, misty sunrises and spectacular sunsets that define the traditional Muskoka cottage vacation. Logpointe is a place where your family and friends can live the true Muskoka cottage experience at its best.